Check out the flapjacks on this Star Wars fan! Great looking Golden Age Sandman costume and a nice Zatanna in the background! 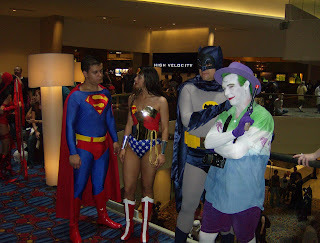 Some nice DC heroes & villains. 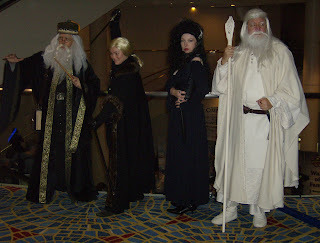 I thought Gandalf looked good. 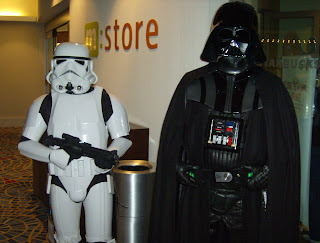 A random shot of one of the hotel lobbies. 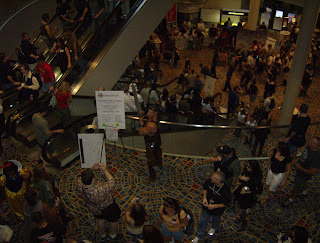 I like the Conan guy in the middle of the photo! 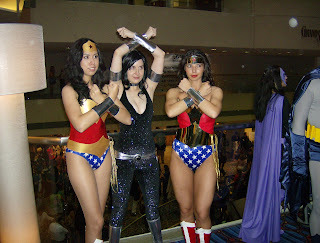 Two hot Wonder Womans and a Donna Troy! 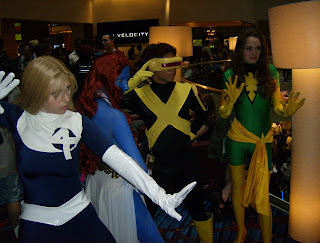 There was so much cosplay (costume roleplay) that I couldn't photograph it all.... I used to think it was a strange hobby, but after seeing these people having so much fun with it, I have changed my mind. These were impressive! 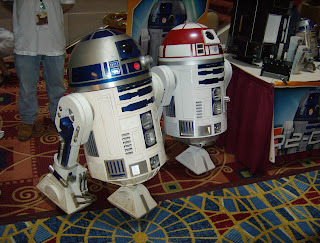 There's a club that builds droid replicas. These friggin' things were spot-on perfect. They lit up, made noise and everything! 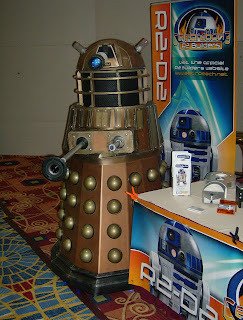 They also made a DALEK! Well, I hope everyone enjoyed my report. 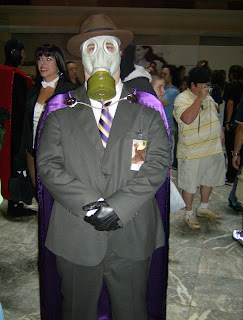 I have to applaud the young man in the Golden Age Sandman costume, as he had the foresight to bring his own gas mask. Having attended a couple of "cons" myself a long time ago, I recall wishing I had brought something with me to filter out the fast food/B.O. melange created by many of my fellow patrons. yeah, the last time I attended one was in the 80's, but I recall the smell as a combination of halitosis, mildewed comic book newsprint, armpit sweat, and jeno's pizza rolls. I was going to give you guys some grief over going for the easy joke, but then I realized ..... you're right!